Add line following to your BBC microbit Robot/buggy projects with the :Move Line Following Board for BBC micro:bit. 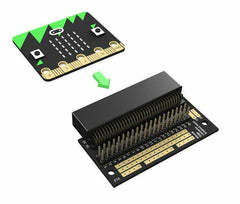 Although designed with the :MOVE mini in mind, this board can be used to add line following to any micro:bit buggy. If adding line following to the :MOVE mini, you will need the Line Following add-on for :MOVE mini instead. 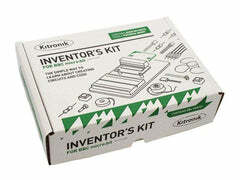 This is because the fixings for the :MOVE mini are not included in this kit. The board can be used to either follow a dark line on a light background or a light line on a dark background. For best results, ensure there is approx. a 5mm clearance between the bottom of the board and the driving surface. The sensitivity of the line following can be adjusted via the two onboard pots, one for each detector. The same pots are also used to change the type of line that will be followed; to detect darker, turn the pot clockwise and to detect lighter, turn the pot anti-clockwise. The board has an operating voltage (Vcc) of 3V and is rated for a max current of less than 1mA. There are two output channels via a 5 pin output that has the following configuration; 0V / Left Detector / 3V / Right Detector / 0V. 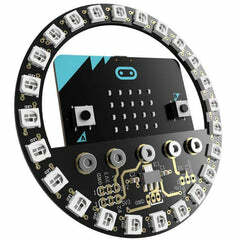 Add line following to your microbit Robot/buggy. Can be attached directly to the underside of the :MOVE mini. Can either follow a dark line on a light background or a light line on a dark background. 1 x :MOVE Line Following board for the BBC micro:bit. 1 x Small flat bladed screwdriver. Line Following Code HEX file. Line Follower Assembly Instructions to show how you might use it.